Baylor University envisioned a multi-use facility to meet the needs of their student body, including a natatorium with a combo fitness/leisure pool. Counsilman-Hunsaker applied their aquatic expertise for Baylor University and designed a plan to seamlessly blend these two bodies of water while making the space as functional as possible. The end result is a diverse design that encompasses a variety of interests of the student body. For those seeking fitness, there is a 25-yard lap pool with three lap lanes, and water basketball. The leisure pool features a triple spiral waterslide and cyclonic vortex. Students can also enjoy a relaxing ride in the current channel or laze about on bubble couches. Complementing the pool is a sundeck and sand volleyball court. 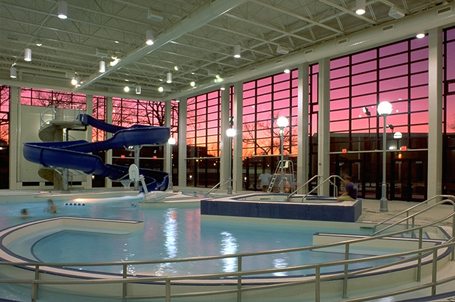 Plenty of sun pours into the natatorium through clerestory and floor to ceiling windows, while sunset allows for some relaxing moments lounging in the whirlpool.